Bullis Charter School has been recognized many times for its ingenuity and signature programs for students. Now school officials are using some of that creativity to design a yearlong program to share their best practices with other educators. Superintendent Wanny Hersey said the school has attracted several visitors – educators from the area and around the world – to observe its STEAM (Science, Technology, Engineering, Art and Math) curriculum at work, but they are usually only there for a day or less. So Hersey joined forces with the Santa Clara County Office of Education to help share the school’s best practices in a more meaningful way – through the program dubbed STEAM: A Practicum on Integrated PBL (Project Based Learning). Over the summer, Hersey said she charged her staff with creating the practicum to help transform local schools “holistically” through two cohorts – administrators and teachers. The goal was to pair an administrator with a teacher so that the two could take what they learned back to their school and district to promote both systematic and curricular change. 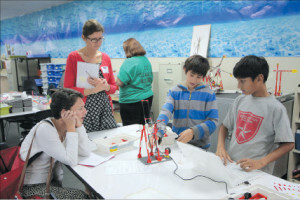 The program, which began last month, includes 27 teachers and 14 administrators from Santa Clara County public schools. Hersey said there are educators from the Union Elementary, Evergreen, Cambrian, Berryessa Union, Alum Rock and Santa Clara Unified school districts. The program requires the two cohorts to visit with the Bullis Charter School team seven times throughout the year – separately and together. Last week, Hersey and her team hosted the administrators, discussing design thinking and viewing two complete STEAM units. She added that the administrators have to look at things from a broader level. Topics include finances, how to secure funding for programs and lessons, and creating a culture that fosters innovation. The teachers will have an opportunity to view the charter school’s project-based learning and STEAM units but will be reviewing them from a different perspective than the administrators. Teachers will also have the opportunity to interview charter school students and teachers to see what works, Anderson-Rosse said. A culmination event is planned for May as the school year comes to a close, Hersey said.